Penguins: All penguins are water birds, unable to fly. There are various species of penguins, all tending to live in colder climates. 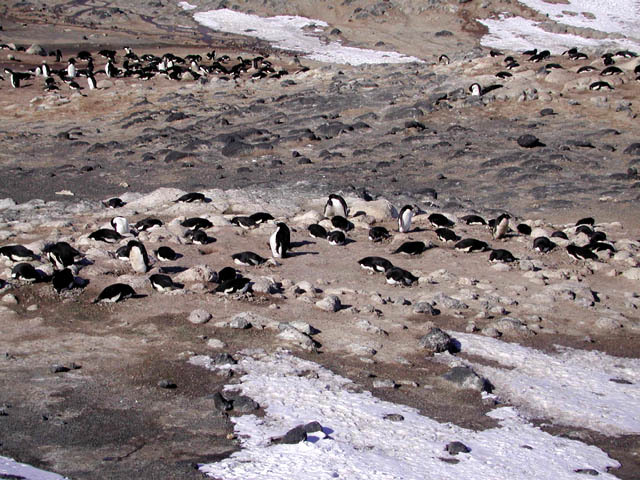 The 2 types that live near McMurdo are the emperor and the adelie. Both are oval-shaped with a black back and white tummy. They have small appendages, a layer of blubber, and thick, coarse feathers. This penguin is the largest and heaviest of all the different species, weighing between 50 and 80 pounds, standing around 3 and a half feet tall, and living more than 30 years. It can be distinguished from the other species by the orange streak of feathers along its neck. The main diet of the bird is krill (a critter similar to a tiny shrimp), fish, and squid. The emperor can dive the deepest of any bird, about 1500 feet and can hold its breath for 22 minutes. Starting with a 6 week prenuptial courtship, there is a 9 month breeding cycle. 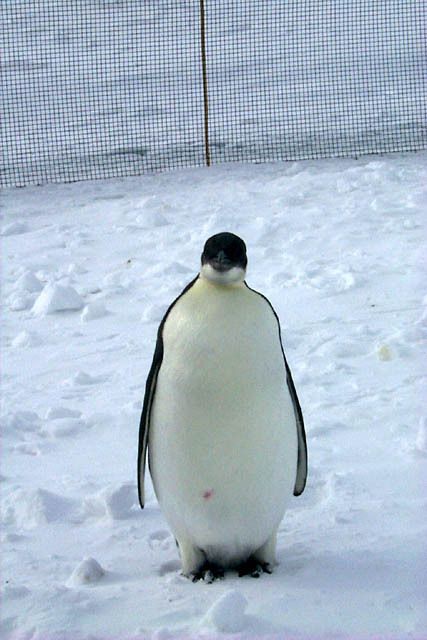 The female penguin lays one egg on the seasonal sea ice in May or June (the beginning of winter). 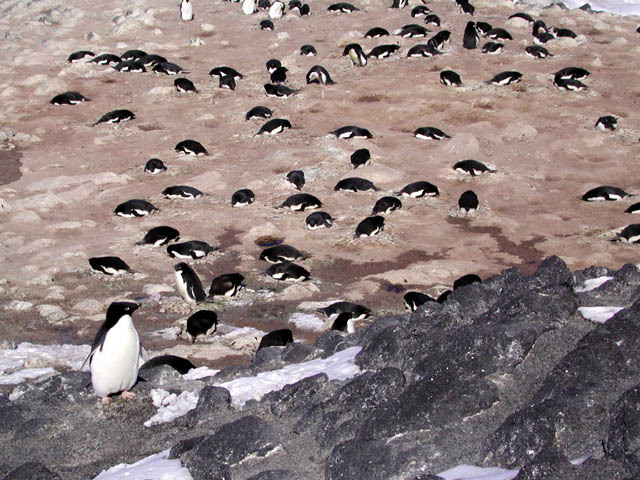 The place chosen to lay the egg is dependent upon the stability of the ice conditions versus the distance to good feeding waters. After laying her egg, the female then travels to the sea to feed for the duration of the winter. The male, on the other hand, just starts his job when the winter begins. He stands with the egg tucked between his belly flap and his feet to keep it warm. All the males huddle together to help keep warm for the entire winter (about 115 days) without even taking a break to eat! Talk about a tough job. The males are fasting for almost a third of a year! The females return just prior to when their chicks hatch and take over the parenting duties for a while. Once the males have fed enough to recover from their fast, they return to their mate and chick. There is a mass movement of the population to a creche, an enormous nursery for the entire colony. From then on, the male and female take turns caring for the chick and feeding in 2 or 3 week intervals. The emperor penguins I saw where chicks that had just lost their down. They were being raised in captivity to study their behavioral and learning patterns. 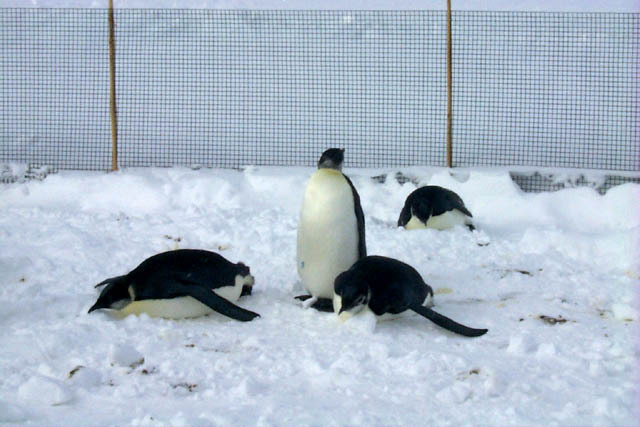 These penguins were chosen because they had a slim chance of otherwise surviving. Listen to some emperor penguin calls. 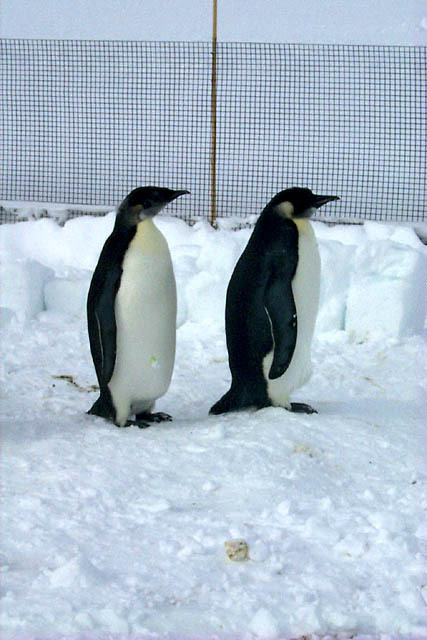 These penguins are much smaller than the emperors, they stand about 1 and a half to 2 feet tall. 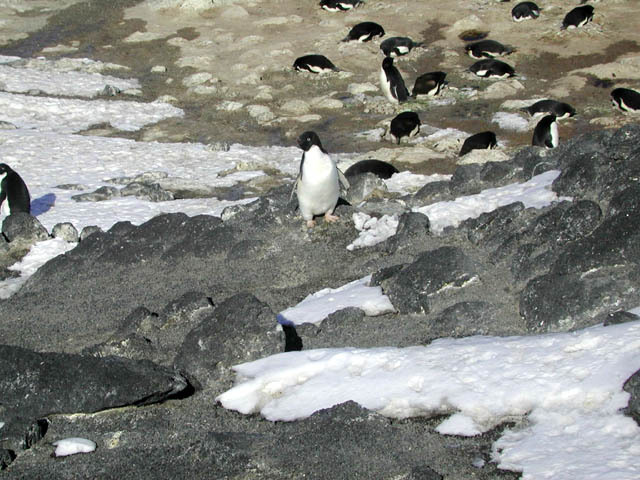 The males and females are of similar size and appearance. I think that these birds are possibly some of the cutest animals ever. They are very curious, silly, and clumsy (on land). They travel quite a bit (in groups), but always on the pack ice. Krill is the staple of their diet, but adelies also eat fish, squid, and crustaceans. Even though they usually feed in the upper 200 feet of the ocean, they are able of going as far down as about 600 feet. Breeding begins between October and March once the birds reach the age of 3-5. The usual lifespan is about 20 years. Adelies lay 2 eggs in nests made from small stones along the coast in regions of exposed rock, raising both chicks provided there is enough food available. Parents will travel from 5 to 120 km off the coast to catch food for their chicks. After about 2 months, the chicks become independent of their parents (imagine yourself at 2 months!). I spotted adelies around McMurdo from time to time, just roaming about. Most of the pictures here were taken at a Cape Royds rookery on the north side of Ross Island by Eun Oh. This species of skua resembles a sea gull somewhat, although it is noticeably larger. It has a white body and brown wings with a white stripe across them. As for the feet, they are large, leathery, webbed things. 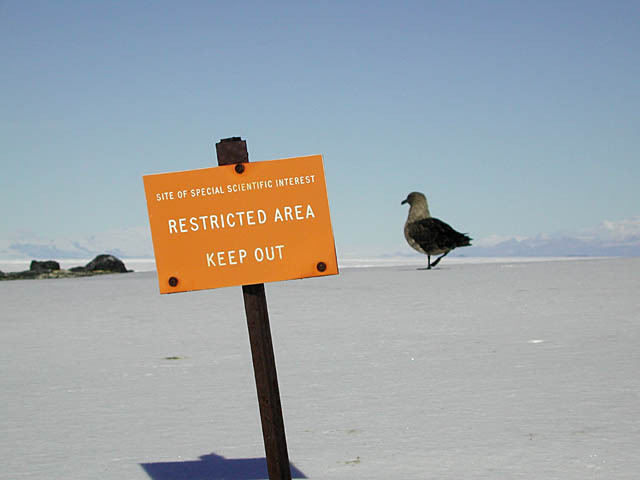 South Polar skua are fairly social and can be found in groups to take baths or nest. The skua is a remarkably aggressive bird. I have heard many tales of people having their lunch stolen right out of their hands! Cross a skua and they don't hesitate to dive-bomb your head. They also possess the delightful attribute of, when feeling threatened, vomiting on their attacker. Good house pet, no? Skuas are scavengers, predominantly dining on krill and fish. 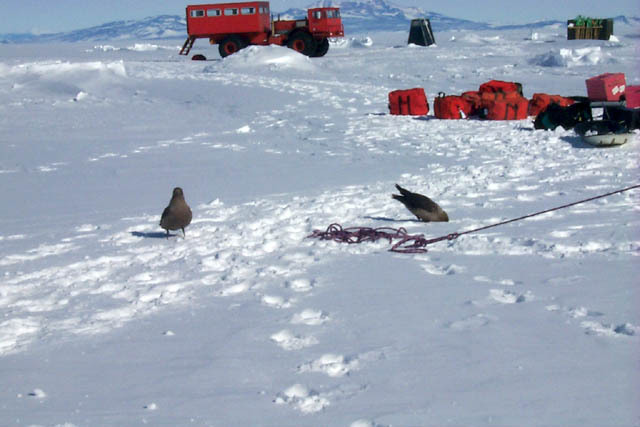 The south polar skua in particular preys on the eggs and chicks of adelie penguins. 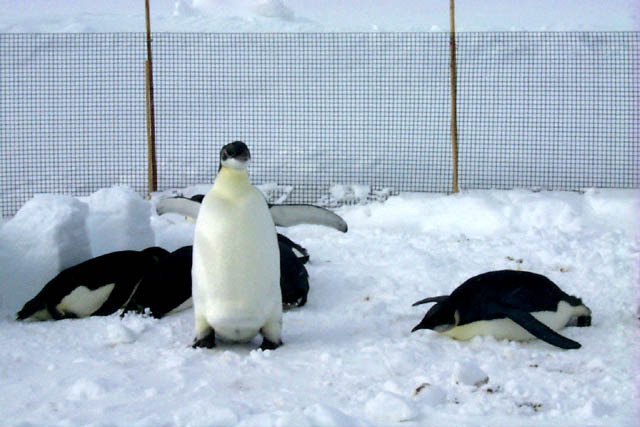 They actually breed on the Antarctic continent itself, starting in the later part of October to sometime in the middle of December. After incubating for 24 to 34 days, skua eggs hatch in late December or January. A certain amount of the young and eggs die of exposure (bad parents!). The nests can be found in sheltered parts of rocky outcroppings; they are just small depressions in the ground. These large, sluggish fish can be found swimming around on the sea bottom, particularly near the shallow water on the coast. Full grown, these grayish fish are at least 3 feet long and weigh anywhere between 40 and 200 pounds (Yikes, I wouldn't want to meet one of them underwater!). All spawning and fertilization occurs externally. A rather unique feature of these fish is a compound which can be found in their blood. 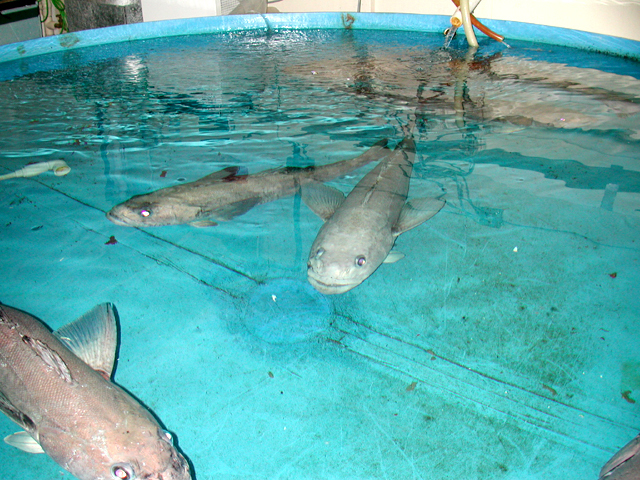 Since fish are cold-blooded, they depend on their environment to keep them at an appropriate temperature. 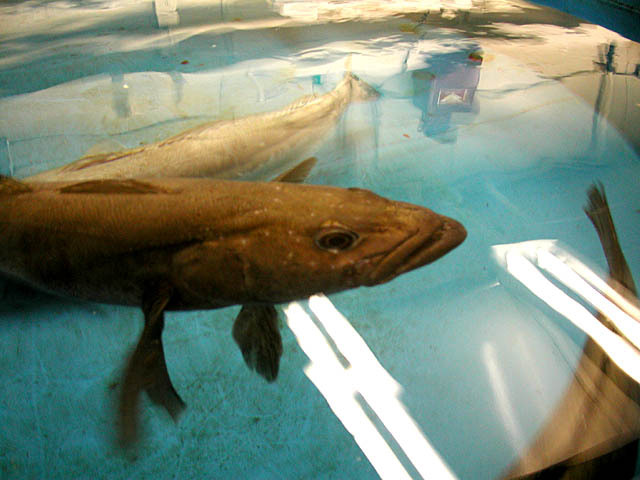 Since the cod is living in waters at 28.8 Fahrenheit, there is a very real danger of them freezing. The compound in their blood is somewhat the similar to anti-freeze. It works by making the temperature at which their blood freezes slightly lower than the surrounding water. So the only way they will freeze is if the whole ocean freezes! The pictures of cod were taken by Elmer Sharp in the aquarium. 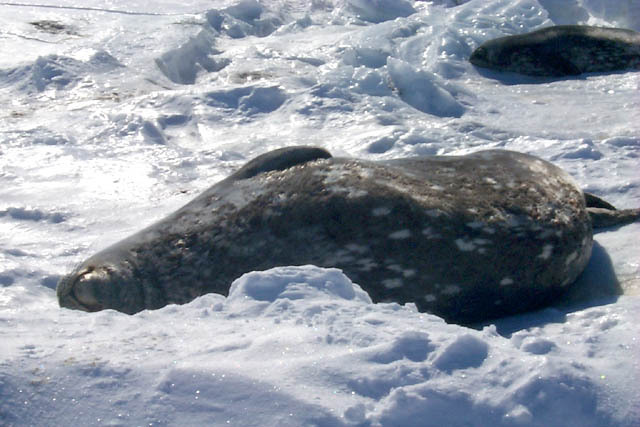 Weddell Seals live the furthest south of any mammal and also permanently inhabit the Antarctic continent. These hardy critters are shaped rather like enormous slugs (although significantly cuter), smallish heads with large, blubbery bodies. They have a gray and black dappled coat with a whiter tummy. 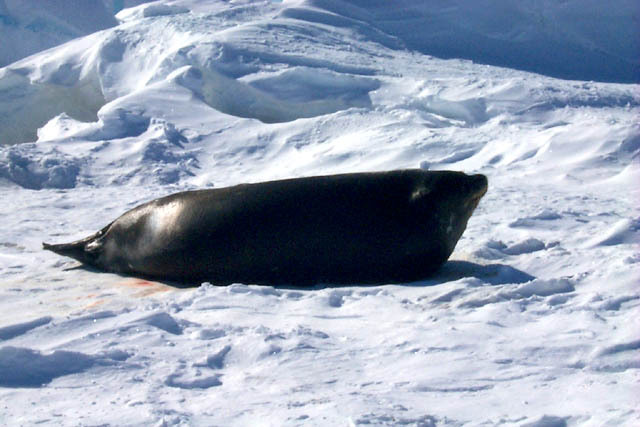 The average adult seal weighs between 800 and 1000 pounds and is about 9 feet long. Weddells are both great navigators and divers. 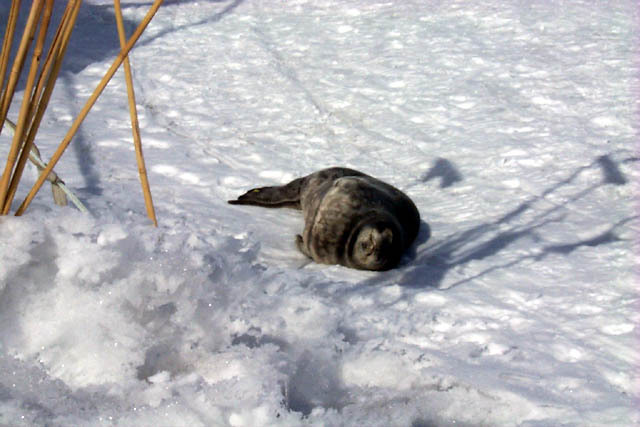 To find food, the seals will swim down about as far as 2200 feet and can go for 45 minutes without coming up for air (wow!!!). Weddells are carnivores, commonly eating fish, octopus, and prawns. They live under the coast-bound ice, chewing away holes in the ice in order to breath. In the summer, this is an easy task because the ice is thin. However, in the winter, this can be so difficult that seals sometimes wear their teeth down to the point where they are unable to feed. Breathing is a more immediate need than eating! Once the seals reach maturity at age 6, they start breeding. In October, pups weighing 50 to 60 pounds are born. In their very first week, they learn to swim and get in and out of the water. The pups are cared for by their mommas for 6 weeks over which time they will gain about 220-280 pounds. 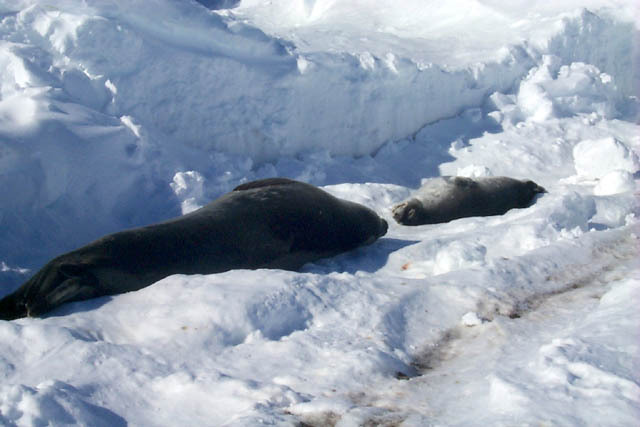 I saw seals quite often by pressure ridges on the way out to Willy Field. The photos shown here are of a pup that got lost and accidentally visited our lab and also from the Razorback Islands. They seemed to spend most of their time on land sunning themselves and napping.